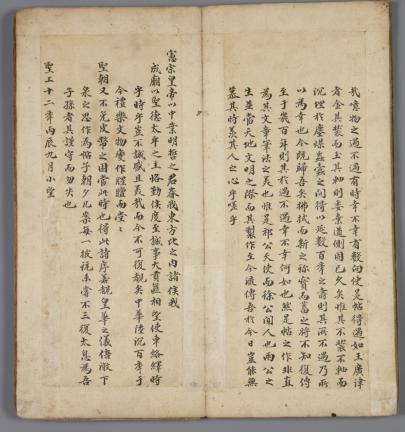 『서거정 필적(徐居正 筆蹟)』서첩에는 1476년(성종 7) 1월말에 우리나라에 온 명나라 사신 호부낭중(戶部郞中) 기순(祁順：東莞人, 1460년 진사, 자 致和, 호 巽川)과 사신일행을 맞이했던 원접사(遠接使) 서거정(徐居正：1420~1488)의 글씨가 함께 실려 있으며 표지에는 ‘천사사한진적(天使詞翰眞蹟)’이라 쓰여 있다. 서첩 앞쪽에는 기순이 40일쯤 머문 뒤 3월 11일에 의주 의순관(義順館)에서 당시 통역을 맡았던 사역원정(司譯院正) 장유화(張有華)에게 지어 써준 가 실려 있고, 서첩 뒤쪽에는 당시 원접사(遠接使) 겸 관반(館伴) 겸 반송사(伴送使)를 맡았던 좌참찬 서거정이 그해 유월 갑술일에 역시 장유화에게 지어 써준 가 실려 있다(앞쪽 탈락). 말미에는 이 서첩을 얻은 사람이 ‘1718년(戊申)에 이 필적을 김홍기(金弘基：자 復初)에게서 얻어 이를 첩으로 장황했다’는 1736년(영조 12) 구월 소망일(小望日)의 발문이 딸려 있다. 조선 초기의 서예유물은 매우 희귀한데, 이 서첩은 원형그대로 남겨진 15세기 조선의 문인명필 서거정의 대표적인 필적이다. 뿐만 아니라 명나라 사신의 필적이 함께 실려 있어 양국의 교류를 살필 수 있는 귀중한 필적이다. 각 글씨 끝에는 연월일과 관직, 인명(人名) 그리고 자호(字號)가 기록되어 있고 이 필적의 전래과정을 알려주는 영조 12년의 발문은 작품의 가치를 한층 높여 주고 있다. 서거정이 행서(行書)로 쓴 원문은 그의 문집인 「사가집(四佳集)」 권6 「증장원정서(贈張院正序)」에 실려 있으며, 「통문관지(通文館志)」 권7에도 수록되어 전해지고 있다. 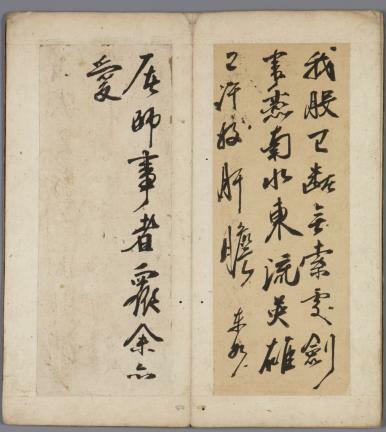 This album of poems contains writings by Qi Shun (admitted into the civil service in 1460, courtesy name: Zihe, penname: Xunchuan), a Ming envoy who visited Korea in late January 1476 (the 7th year of the reign of King Seongjong during the Joseon Dynasty), along with writings by Seo Geo-jeong (1420-1488), who received and hosted him in the capacity of Joseon’s state representative, during this visit. 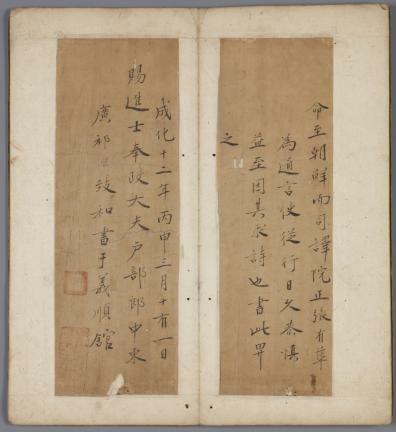 The cover page displays the title “Cheonsa sahan jinjeok (Veritable Verses by the Envoy of China).” At the beginning of the book, there is a long five-word poem that Qi Shun wrote for Jang Yu-hwa, the Korean interpreter who assisted him during his stay in Uiju, on the 11th day of the third lunar month, about forty days into his visit. 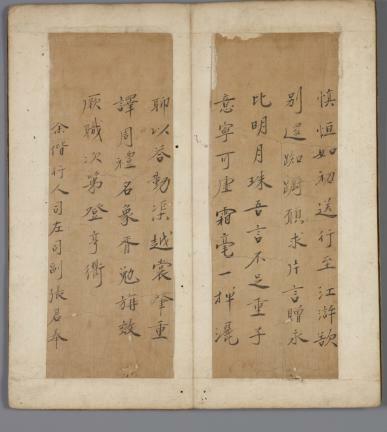 Toward the end of the album is a poem Seo Geo-jeong wrote also for Jang Yu-hwa, on the gapsul day in the sixth lunar month of the same year. 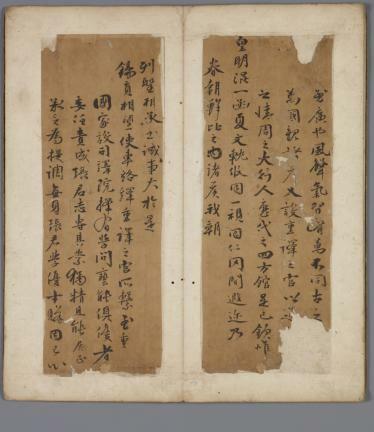 The page containing the beginning portion of the poem, however, is missing. 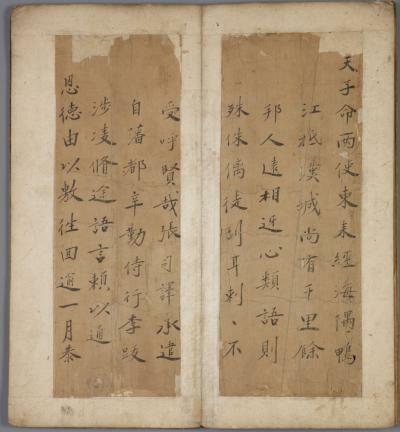 The album has a postscript at the end, dated the somang day of the ninth lunar month in 1736 (the 12th year of King Yeongjo’s reign), which states that manuscripts containing these writings were obtained from a certain Kim Hong-gi (courtesy name: Bucho) and were bound into an album. 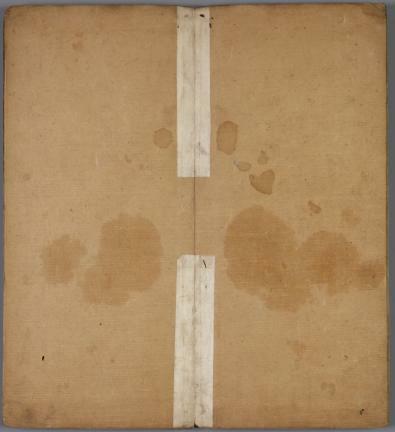 There are very few extant calligraphic works from early Joseon. 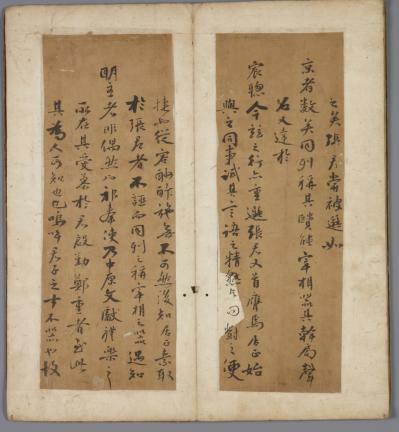 This album containing a poem written in the hand of Seo Geo-jeong, a celebrated literati calligrapher of the 15th century, is also of enormous significance in that it also contains a work by the Ming envoy he was hosting, offering windows into the historical exchange between Joseon and the Chinese dynasty. Each text is dated, and the name of their author is accompanied by their title and rank, courtesy name and penname. 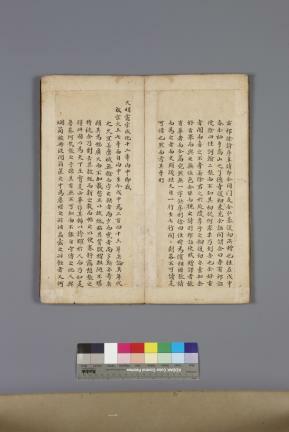 The postscript from the 12th year of King Yeongjo’s reign explaining how these calligraphy texts were obtained adds further value to this album. 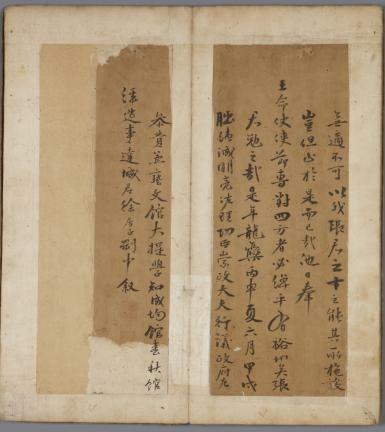 Other examples of Seo Geo-jeong’s writings in semi-cursive script are in Volume 6 of his literary anthology, Sagajip (Anthology of Four Beauties) and in Volume 7 of Tongmungwanji (Chronicle of the Office of Interpretation).